An inkjet ink formulation can be explained fairly simply (Figure 1). It consists of a carrier fluid that keeps the ink in a liquid state and acts as a carrier for the colorant. This fluid evaporates as the ink dries, leaving the colorant in or on the media surface. The carrier fluid used in most popular desktop and wide-format photo printers is water; the colorant is either dye or pigment, or a combination of both. A co-solvent, usually glycol or glycerin, is often used to control the ink's drying time, as well as its viscosity during manufacturing. Small amounts of other additives are also present in most inks. These additives help control things like dot gain, drop formation, print head corrosion, pH level, fade resistance and color brilliance. However, in simple terms, you can think of ink as being a carrier fluid and a colorant. The difference between a dye and a pigment is simple to explain. A dye is a colorant that is fully dissolved into the carrier fluid, and the resultant ink is a true solution. Once dissolved into the carrier fluid, a well-made dye should never separate or settle out. One dye ink analogy is that it's like diluting a fruit juice with water. Once stirred, it never separates again - no matter how long you leave it. A pigment is a very fine powder of solid colorant particles suspended or dispersed throughout the carrier fluid A crude analogy for a pigment ink is that it resembles sandy-colored water in a river or at sea. If you look closely, you can see the particles of sand dispersed throughout the water. The secret in making a good pigment ink is to keep the pigment suspended in the carrier fluid for a long period of time, particularly at the low viscosities required for inkjet printers. Pigments have a natural tendency to settle out much like the sand in the sandy water analogy. There's a rule that says when any inkjet ink dries by evaporation, the dried ink must be able to be re-dissolved by the liquid form of the same ink. Sounds pretty simple, right? This concept is vital for an inkjet printer to function reliably. Let me explain. Most photo-quality inkjet devices use print heads with hundreds of very small jets that eject the ink onto the media. Liquid ink is always present at the jets opening, and if you use an ink that dries by evaporation, theres a good chance the ink will dry up and clog these openings. The challenge is to manufacture a printer that doesn't clog during the printing process, but nonetheless has fast-drying output. 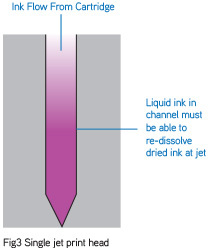 If we take a closer look at a single jet on a print head with dried ink clogging it (Figure 3), we see that the easiest way to remove the clog is have the liquid ink redissolve the dried ink. Another way of doing this would be a separate washing system that bathes the head in an ink dissolving solution. However, this adds considerably to the printers complexity and price. Its much simpler to stick to the concept above, and depend on the ink to unclog itself. One common misconception is that when a jet (or jets) clog on an inkjet printer (evidenced by lines or banding in the print), it's caused by an impurity or lump in the ink. In 99.9% of the cases, the clogged jet is caused by dried ink or an air bubble in the ink. Air in the channel behind the jet on a print head is a sure way of stopping the jet from firing correctly, since the air acts as a shock absorber to the firing action. This is why you often have to perform several cleaning operations on a printer when you change a cartridge particularly on Epson and Canon permanent print head models. The simple act of removing a cartridge and inserting a new one allows air to get into the print head; the cleaning cycles remove it. The increase in the use of pigment ink in photo quality inkjet printers - and the marketing frenzy that has followed - has left the average inkjet user confused, and in many cases, disappointed. There are two misconceptions about dye versus pigment. First, pigment inks are always more light stable than dye-based inks; and second, pigments now match dyes in terms of color quality. It's true that pigments generally are more fade-resistant, particularly for outdoor exposure where the intensity and type of light is very different than artificial illumination. However, for indoor display, the gap is closer than you might imagine. We see the colors of a print by the light reflected off the prints surface. The particles in a dried pigment ink have a very rough surface, so the light reflected off the print tends to scatter (Figure 4a) which can produce a dullness to the print. 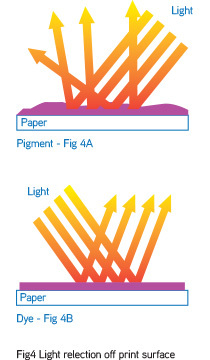 On the other hand, dried dye ink has a smoother surface that reflects the light back more uniformly (Figure 4b) producing a more vivid print to the eye. The latest pigment preparation technology improves the color quality by grinding the particles to the smallest possible size and using resins to coat the particles, which helps smooth out the rough surface. One major printer manufacturer implies that their pigment inks contain particles that resemble perfect round little spheres. I can assure you that these particles still look like little uneven meteorites when viewed under a powerful microscope. The only way to maximize a prints fade resistance is to ensure that all components are tested together. This is why ink suppliers also sell media and protection sprays, which have been tested for longevity as a complete system. Another favorite trick of inkjet marketers is to show color gamut comparison diagrams in promotional literature. These illustrations are two-dimensional diagrams showing how big a color space an ink has compared to a competitor. However, these 2-D charts only show the range of achievable colors that can be had from an ink set, and don't show the brilliance level of the colors, which can only be represented in 3-D. Conducted a very simple test takes the leading OEM pigment ink set and a long-life dye-based ink set, and making a 2- D color comparison charts using topend color measurement equipment (Figure 5). The dye ink had a slightly larger color space, but the color gamut of both inks was very similar. Then, I made prints on the same media using the same color print file. The results were vastly different. The dye-based print was more intense and brilliant. The point is that 2-D gamut comparison charts do not tell the whole story. The best way to make a true comparison is with the actual printed images. If there were ever a more misused word in our industry, it would be archival. 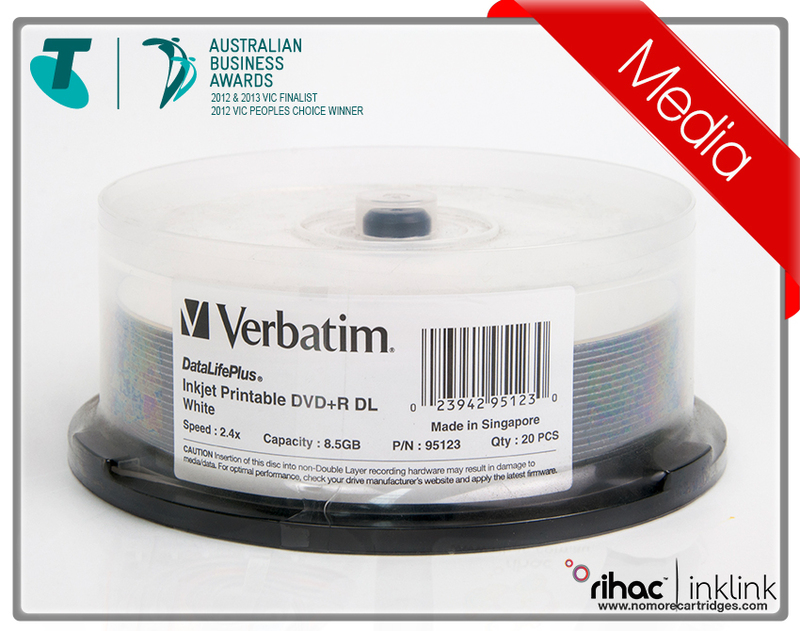 The dictionary defines this word as, of, relating to, contained in, or suitable for archives. It mentions nothing about lasting a long time on display .The ink industry is intent on branding every type of product , from inks to media, to laminates and protection lacquers - as archival, implying that they are long-lasting. The simple fact is that an inkjet print is a combination of several components - ink, media, protection spray or laminate, mounting material, matte board, framing material, etc. Each can have a dramatic effect on an images display life. Two instances come to mind. One photographer produced a beautiful series of images using archival media and standard dye-based ink. He was led to believe that the media alone would make his prints fade-resistant. Another photographer used a well-respected, long-life ink set with media from a different manufacturer. He experienced rapid color shift as the ink and media chemically reacted. The only way to maximize a prints fade resistance is to ensure that all components are tested together. The subject of longevity testing and the methods used is a minefield. Unfortunately, there is no internationally accepted standard for longevity testing of inkjet produced images. An American National Standards Institute (ANSI) working group composed of technical representatives from many major inkjet manufacturers has been working for years towards a testing standard, but its yet to be approved and published. Thats why you should use common sense when interpreting marketed fade test results. Also you ensure you read the fine print. In most cases you will find that realistic print life is significantly less than those marketed by the major print media manufacturers. The only way to determine the life of an image (other than displaying it and waiting) is to accelerate the fading. Usually, this is done by exposing an image to a high intensity light source, then extrapolating the resulting fade over time. When doing this, its very important to control the environmental conditions, such as temperature and humidity, as these can have a dramatic effect on fade rates. Its also logical that the type of light source used to accelerate the test should be similar to that where a print will be displayed. One common procedure, the blue wool test, uses a xenon light source to simulate sunlight. This test originally was created by the textile industry to determine the light fastness of textile dyes. However, it has been proven that the fading effect of artificial light can be very different than that of sunlight, and this test has proved to be somewhat inaccurate for predicting fade rates under indoor display conditions. There are stranger test procedures out there. One pigment ink manufacturer actually dips prints into a bleach solution, then measures the resultant fade over a period of time. Their biased results show how much better their products are than dye inks. Any college chemistry student knows that dyes can be bleached faster than pigments. As a major manufacturer of third-party inks, were often asked, Will the use of your ink void my printers warranty? Printer manufacturers like to publish warnings that imply this will happen if a non-OEM ink set is used. This question is very simple to answer. The law states that a warranty cannot be voided by simply using third-party consumables in a printer. Its the responsibility of the printer manufacturer to prove that an ink caused the damage before refusing warranty repair. Generally, inkjet printers are pretty reliable, but a small percentage do fail under warranty ”regardless of the ink type used. My advice to anyone with a warranty failure is to remove any third party cartridges from the printer, then return it under warranty as normal. Or, if you have a wideformat photo printer and receive on-site service, keep a set of original cartridges and always make sure these are in the machine when the technician arrives. In my experience, if you follow these suggestions, you wont be refused warranty repairs. As mentioned earlier, a perception promoted by printer manufacturers is that all third-party inks are inferior in quality. Its worth noting that very few OEMs make their own inks. Instead, they buy them from an ink manufacturing specialist. Its also worth noting that many ink companies have been making inkjet inks for longer than the photo printer OEMs have made printers. With photo-quality inkjet printers now widely used for the commercial production of images, many third-party ink companies have introduced bulk-ink feed devices that provide a continuous ink supply (CIS) to the printer, eliminating the need to change cartridges. The potential reduction in consumable costs is enormous, equaling about a 90% savings over buying original cartridges. These devices are bad-mouthed by printer manufacturers because they take away a valuable revenue stream, and are claimed to be unreliable, difficult to install, and, worse yet, damage the printer. In some cases, this is true; there are some poorly made systems out there. However, a well designed bulk feed system can actually increase the printers reliability. The reason a printer requires several cleaning cycles after a cartridge change is because of air ingress into the print head. Weve found that bulk feed attachments are more trouble-free since the need to run cleaning cycles is dramatically reduced. 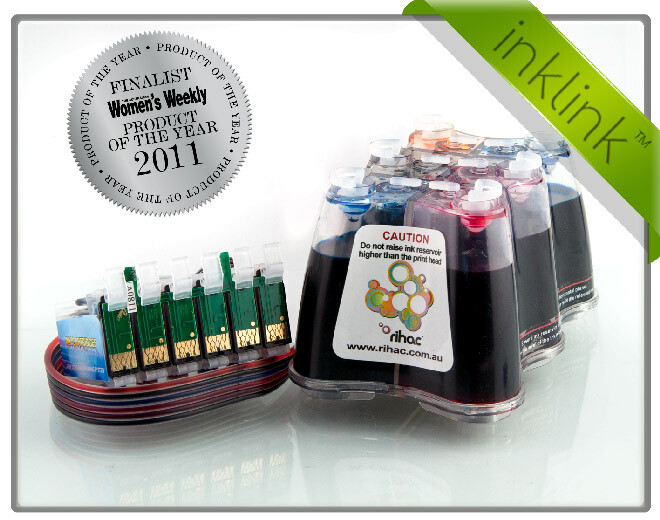 Here are some tips when choosing a bulk ink feed system. First, find out if the system comes with pre-primed ink cartridges. A lot of these systems are supplied empty (the ink is sold separately), and the user must first fill the cartridges using syringes or a small suction pump. Dont be afraid to ask awkward questions when selecting a printer, an ink type or a media. Any reliable supplier should be able to answer most queries and back up their products with factual information. In summary, here are a few points to remember. Do not be misled by OEM publicity regarding poor quality third-party products. Remember these guys make a huge percentage of their profits from consumables. Choose between pigments and dyes wisely. The choice is a compromise between color quality and longevity. For extreme long life requirements, pigments are the way to go, but they have reduced color quality when compared to dyes. For very good life and great color, go with the dyes. 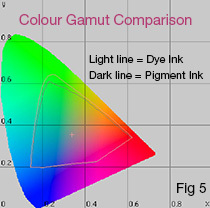 Dont be fooled by color gamut comparison charts. Ask to see direct comparison prints on the media you want to use. Avoid using pigment inks in printers designed for dyes. It can work, but often ends in tears.